MINAMISANRIKU, Japan — It has been one year since a magnitude 9.0 earthquake rocked the Tohoku region of Japan and sent a series of tidal waves that wiped out much of the northeast coast and created an ongoing nuclear crisis. In the small town of Minamisanriku, Miyagi Prefecture, more than 75 percent of the city was destroyed. The town was literally washed away. More than 500 people died and over 100 are still missing. On Sunday, March 11, it was standing room only at the Bayside Arena, where more than 3,000 people gathered to pay their respects to those who had perished and those who are still missing. 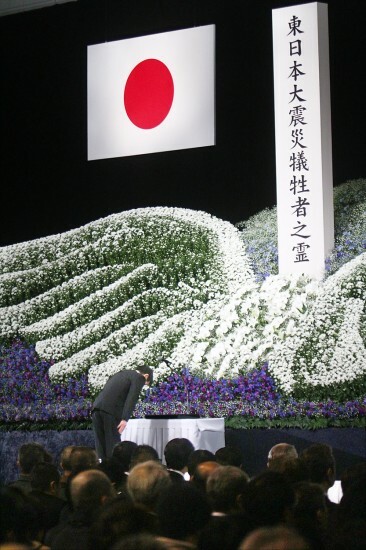 Emperor Akihito and Prime Minister Yoshihiko Noda addressed the nation at a memorial service in Tokyo that was simulcast to all the memorial services across the country. Minamisanriku Mayor Jin Sato, who himself barely survived the tsunami by clinging to a broadcast antenna atop the three-story Minamisanriku town hall building, and Miyagi Prefecture Governor Yoshihiro Murai also spoke at the service. March 11 in Minamisanriku, Miyagi Prefecture. Students from Minamisanriku elementary schools perform a song they wrote at the one-year memorial service for the Great East Japan Earthquake and Tsunami at Bayside Arena. The service featured several chorales of students from the local elementary schools, each singing songs they had written, and ended with a presentation of flowers for all in attendance. As I was leaving the service, someone was calling my name. I turned around to see Mitsuaki Maeda, his daughter Juri and niece Megumi. I was very happy to see them. I held back tears as Megumi showed me a picture of her mother and father, who passed away in the tsunami. When I first met Mitsuaki in June of last year, he introduced Megumi to me as his own daughter. It was only later that I learned that his brother and sister-in-law had died and he had taken on the responsibility of caring for Megumi. It is this deep commitment to family and values that keeps bringing me back to Minamisanriku. Mitsuaki is one of the people who truly inspires me to help the people in Japan. He lost his brother, his sister-in-law, his home and his sushi restaurant. Yet, despite his tragic losses, he still wears a smile on his face and remains positive about the future. I met him and his family for lunch the following day at their temporary housing unit. He told me that my friend Ken Matsui and I were the first people he ever met from outside of Japan when we were there cooking a barbeque for the evacuation shelter he was staying at. Since then, he said that he is now learning English and watching American movies because he wants to learn more about life and cultures outside of Japan. Kizuna is the Japanese word that describes the bond and emotional ties between people. Since the triple disaster, it has become more widely used as more people create those bonds by working together to rebuild their lives and their communities. During these past few days, several people have told me that they really appreciate it when people come to visit them. It’s not the donations or the money that are important to them. It’s the relationships with others that raises their spirits. It is my hope that these bonds, the spirit behind kizuna, will last forever.